This is intended to show with tape ruler, digital scale and photographs some of the differences between the Broil King 63980 Charcoal Chimney Starter and the Weber 7416 Rapidfire Chimney Starter. It should be noted that the Weber unit has been used at our lobster dock since last May and the Broil King Unit just arrived. Opening and using a new bag of Kingsford briquettes for uniformity. Physical characteristics- The Broil King is shorter, it also has a slight taper to widen just a bit at the top. The Weber seems like it would have more air flow with the wire rings. the Weber also has the hinged handle which when extended will keep your steadying hand further away from the hot coals. They both are well built and sturdy. Filling each starter with exactly 4.6 lbs of charcoal the Weber can hold slightly more than the Broil King (not very significantly more but there is a little more space at the top, probably an additional 6 briquettes. The extended hinged secondary handle on The Weber extends further than the Broil King- 7.25 inches vs 4.5 inches. The Weber 7416 Rapidfire Chimney Starter is a little over half the cost of the Broil King 63980 Charcoal Chimney Starter . 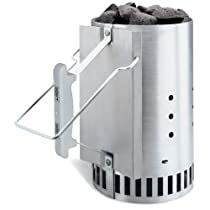 It is heavier, it holds slightly more charcoal, it has more space for air to flow upward to start the charcoal and it has the secondary hinged handle which help to control the chimney when its full of hot coals. Some things I like about the Broil King is that it is stainless. I’m not sure if it will hold up better than the Weber over time but at almost twice it’s cost I doubt you would get almost twice as long with it. Maybe you could though. I also like that the holes in the bottom which are shaped like flames are large enough that you could stick the end of a long lighter into completely whereas on the Weber you have to lift the chimney with one hand and light it from underneath. For the money I’d purchase the Weber as you could almost afford two for the same price as the Broil King and I don’t see enough significant features that would make it worth almost double the price. In fact The Weber is a little heavier and can hold slightly more charcoal. 6:20PM All the briquettes were glowing except for the top row. Ready for the cook. It was easy enough to handle and the extra handle of the Weber is actually a non-factor one way or another for my use. Pouring the coals into the charcoal basket was easily controlled without the hinged extra handle on the Weber unit. The handle on the Broil King 63980 was cool to the touch and the heat deflector did its job well. As you can see after the first use it is obviously discolored. This as we know does not effect performance but it’s worth noting that it will not be looking like the stainless out of the package unit that came shipped after it’s initial use. After one week outside the Broil King Chimney that is supposedly made out of stainless steel has significant rust on it. Another problem I’m encountering is that with the slightest breeze it tips over because it is not very heavy and the weight of the handle topples it making it difficult to fill because you need to hold it with one hand while dumping the charcoal with the other arm. I can’t under any circumstances recommend the Broil King Chimney, In fact I feel like it should be returned for the simple reason of rusting after only a week outdoors.